If you're involved in mobile marketing, you know how powerful contests can be. Getting customers to enter your contest by sending a text message is a simple and powerful way to grab their interest. However, ProTexting also offers an alternative method of entry to enter contests. This feature can be used not only for contests but also for other types of promotions. Text 2 Win campaigns are among our most popular features for engaging customers. This type of sweepstakes is a great way to build your brand, increase the size of your customer list, and encourage sharing. Many of our clients, including restaurants, charities, dentists, and all types of retail stores have successfully run these campaigns. However, you also need to provide people with an alternative way to enter the contest. For one thing, this is the law. Forcing entrants to send a text message is the equivalent of demanding that they make a purchase. You are required to provide a free way to enter your contest. Apart from compliance, it’s also a sound marketing principle to offer people alternative ways to enter your contests or participate in any of your promotions. Those who prefer not to enter via texting can fill out a simple form. This will be considered a valid entry just as if they had entered by text. Aside from contests, there are other uses for this feature as well. Another popular feature that helps businesses attract returning customers is the SMS Loyalty Program. Customers can join your loyalty program simply by texting a keyword. You can then reward your most loyal customers with discounts, freebies, and other perks. This is one of the best ways to encourage people to return to your business. 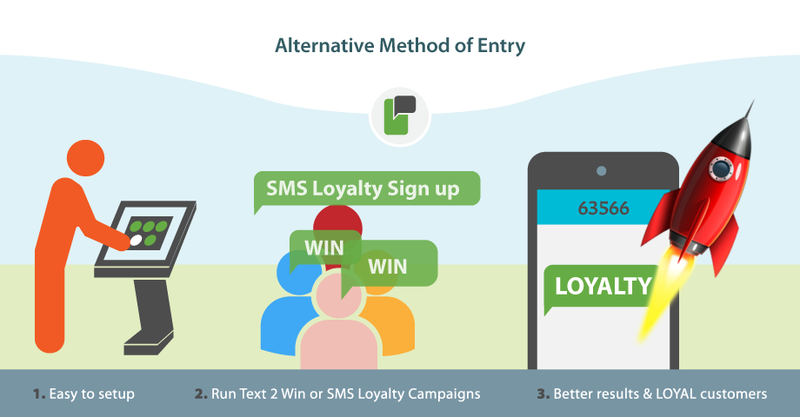 As with contests, customers typically join your loyalty program by texting a keyword. However, you can also offer them an alternative method of entry to join in which they fill out an online registration form, easily embedded within the SMS Loyalty sign up kiosk. You decide how much information to collect (e.g. phone number, name, email, zip code, etc. ), which is automatically stored in the account. With all the data in one place, you can easily integrate and sync with Zapier, MailChimp, RESTful API or other external marketing or CRM systems. An alternative method of entry (AMOE) can be applied to any messaging campaign that requires customers to provide information. Your dashboard will tell you how many people entered using texting or an alternative method. This allows you to perform analytics and see which methods your customers are using most. Our alternative method of entry feature ensures that you comply with laws regarding contests. It also makes it easier for your customers to participate in your contests, loyalty programs, and other promotions. The more choices you give people to engage with you, the more participation you'll see with your campaigns.